Occupational asthma is common occurrence in a significant number of adults suffering from the disease. Even after the cessation of exposure, the asthma remains dominant. Previously, Vitamin D intake was rarely evaluated in cases of occupational asthma regardless of it being an important part of nutrition. The main objective of this study is to assess the Vitamin D intake in occupational asthma patients and its relation with body mass index, co-morbidities related to Vitamin D deficit, lung function and quality of life. The researchers found a reduced Vitamin D intake in both irritant and allergic asthma both in obese and non-obese patients. Even though the average intake levels were comparably higher in non-obese patients than obese patients, it did not reach to a significant level. Lower intake was also found in mild asthma group compared to severe asthma group, marginally reaching significance level at the median test. Regression analysis revealed a different pattern in the asthma groups. The Impact score in irritant asthma indicated a stronger relationship with BMI while the symptom score in allergic asthma group was closely associated with the Vitamin D intake. 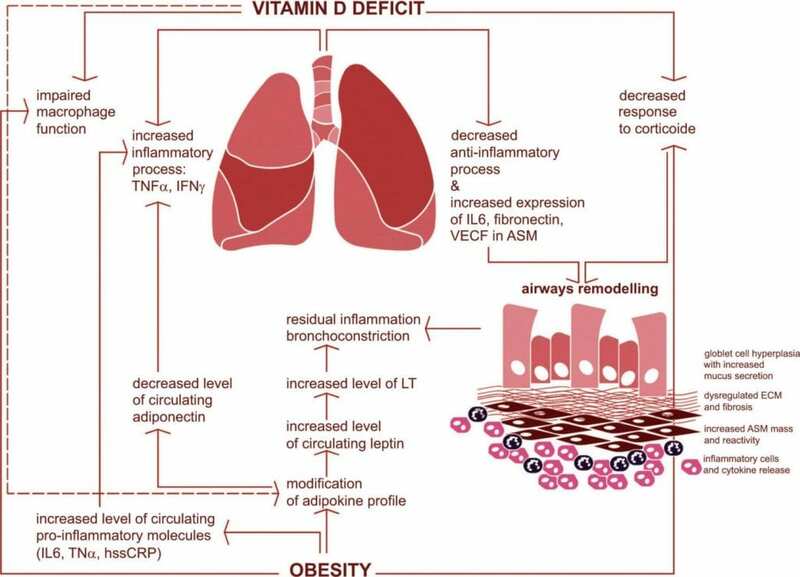 The researchers concluded that the relation between obesity and vitamin D on clinical cores and lung function depended on the asthma phenotype. It was recommended that the nutritional interventions in all occupational asthma phenotypes should be an important aspect in future treatments, especially targeting body fat reduction and achievement of daily recommended intake of Vitamin D. When studying the impact of weight loss on asthma progression, it was concluded that Vitamin D status should be taken as an influencer.